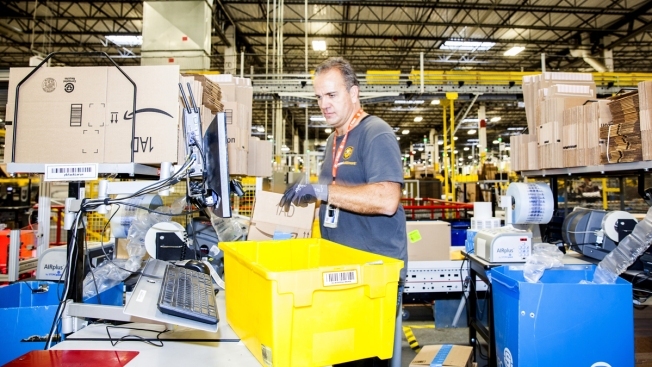 An employee packs orders inside an Amazon.com Inc. fulfillment center in Robbinsville, New Jersey, U.S., on Monday, Nov. 28, 2016. It's barely Thanksgiving and online shoppers have already spent $28.6 billion shopping online, 18 percent more than they did last year, according to Adobe Analytics. Cyber Monday, the Monday after Thanksgiving, is expected by Adobe to be largest online shopping day in history, with an expected $6.6 billion in sales, CNBC reported. In all, online holiday spending is expected to generate $107 billion in sales, an increase of 14 percent. In each of the first 21 days of November more than $1 billion in revenue was rung up, compared to 19 out of the first 21 days in 2016, Adobe said.